Ryan Meagher is hard to miss on the Portland scene these days. In addition to his hand in the Montavilla Jazz Festival and various educational efforts (and, it must be said, editing this very publication), Meagher (pronounced Marr) is constantly jumping into new projects as a performer and composer. 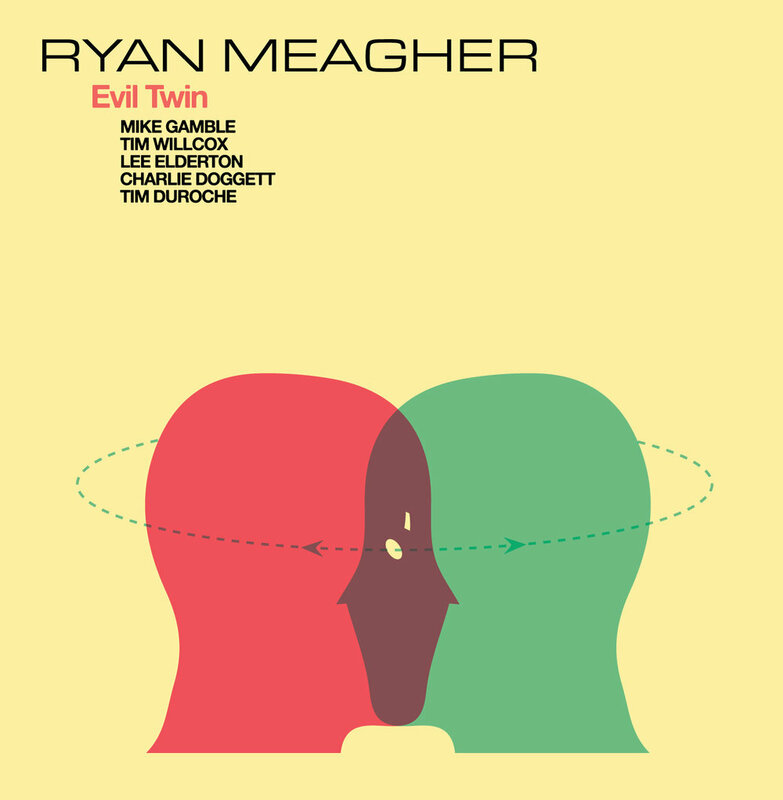 Evil Twin is a particularly enthralling leap for the guitarist; it’s a lengthy collection of free improvised pieces featuring a “double trio” format reminiscent of Ornette Coleman’s seminal album Free Jazz. With an additional guitarist, Mike Gamble, in the mix, as well as a pair of horn players (saxophonists Tim Willcox and Lee Elderton) and drummers (Charlie Doggett, Tim DuRoche), the spotlight is decidedly off Meagher, creating the feeling of a true ensemble. Even without listening to the record, track titles like “Covfefe” and “Confirmation Bias” reflect the fact that many of the improvisations were prompted by current political themes. Other track titles are topical but less bleak, like the amusing, viral video-referencing “Yanny and Laurel.” And the music itself does wear an atmosphere of paranoia and suspense, established most effectively through Meagher and Gamble’s watery guitar textures. While the first couple of tracks struggle a bit to gain momentum and dynamism, the album picks up from there and proves to be full of surprises. The opener, “I Am Complicit in the Murder of Our Oceans,” is a fitting introduction, with twinkling percussion, yearning saxophone melodies, and spacious guitar. But the ensemble approaches the next piece from a similar angle, with more long tones and anxious ambience. Things pick up soon, though, with “Covfefe,” a dense piece with wailing saxophone and clattering drums, and the dynamism continues for the rest of the album. Notes of swing even crop up during “The Blood Albinos of Hicks Road.” Perhaps the most curious experiment is “Blocks Better,” an audio collage of separately recorded solo improvisations by the ensemble members stitched together by Clay Giberson. With fragmented rock beats and gestural and melodic saxophone playing, it’s a remarkably cohesive piece, but it’s a testament to the ensemble that the rest of the music, spontaneously composed, sounds just as cohesive and compelling.